Prison toilet and basin combination (Franke Model HDTX850) – Bolt Fix Combination WC Pan and Wash Hand Basin, 390 x 322 x 955 mm high. Unit to be manufactured from Grade 304 (18/10) Stainless Steel, 1,2 mm gauge pan and basin, with 1,6 mm gauge pedestal. Supplied complete with an integrated wash hand basin with a pressed perforated outlet to suit a 40 mm waste fitting, and 150 mm high splash back with a provision for the basin spout and push buttons for the flush valves which must be installed in the duct behind the unit. Pan to be positioned to the left, right or center…(please specify). 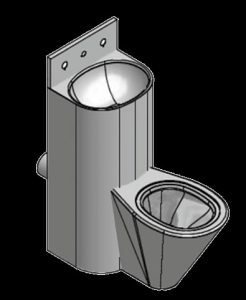 The pedestal of the unit to be manufactured with a built-in toilet roll holder (optional…please specify) and flanges with fixing slots for 8 mm threaded rods to secure the unit through the wall (Threaded rods elsewhere measured). Compliant with SABS 1733:1998 and SABS 497:1991 WC pan to flush with 4 and 6 liters of water. Pan to withstand point load of 400 kg as per international standards. F-HDTX651-C Side view diagram. Not the position of toilet roll holder. Franke Security Frame for HDTX850 Combi Unit. 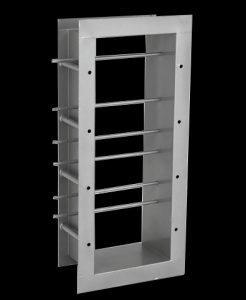 Unit to be manufactured from galvanized mild steel, 525 mm x 950 mm wall sleeve with 6 x 13 mm Ø anti- escape bars, positioned to allow access to the inlet and outlet. Unit to be built into brick-work and combination unit to then be mounted to the unit. Frame used to install the HDTX850/851 toilet basin combo. The frame is built into a wall. Franke Model HDTX860 Push Fit Combination WC Pan and Wash Hand Basin 390 x 400 x 955 mm high. Unit to be manufactured from Grade 304 (18/10) Stainless Steel, 1,2 mm gauge pan and basin, with 1,6 mm gauge pedestal. Unit to be supplied complete with an integrated wash hand basin, with a pressed perforated outlet to suit a 40 mm waste fitting and 150 mm high splash back with a provision for the basin spout. Pan to be positioned to the left, right or center…(please specify). The pedestal of the unit to be manufactured with a built-in toilet roll holder (optional…please specify) and eight 6 mm slots and security screws to secure the unit to the wall mounting frame. Pedestal with provision for push buttons for the flush valves which is installed in the unit. The Stainless Steel wall mounting frame to be 3 mm thick with eight nutserts and to be fixed to the wall with anchor bolts (bolts elsewhere measured). Compliant with SABS 1733:1998 and SABS 497:1991 WC pan to flush with 4 and 6 liters of water. Pan to withstand point load of 400 kg as per international standards. F-HDTX861-C Side view diagram. Not the position of toilet roll holder. The combination toilet pan and basin prison unit is manufactured from grade 304 stainless steel. Overall dimensions are 652 x 380 x 995 mm. The unit comes with a integrated toilet pan and basin combination with enough space at the back for flushing mechanisms. Recommended flush mechanism is from Walcro. A small 150 mm high splash back suits the WC-SSB/15 drinking fountain spout which can be activated by installing a wall mounted concealed push button metered valve. 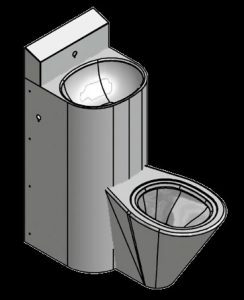 The prison toilet combo comes in three configurations, left, right and center toilet bowls. Product codes are as follows.